The 2017 Southeastern Showhouse, Atlanta Homes & Lifestyles’ second foray into the showhouse circuit, was a stunner, at least according to what I could see on all the Instagram feeds. Knowing their graciously well-heeled and well-mannered Southern audience, designers brought out the beautiful and left the daring at home. Gordon Dunning (I featured GD as one of my designers-to-watch in the recent Spring 2017 ORC), Tristan Harstan, and Lauren DeLoach had particularly lovely entries, but I have to say that my all-out favorite was this traditional-with-a-twist, granny chic goodness by Sarah Bartholomew (all pics via @sarahbartholomew). 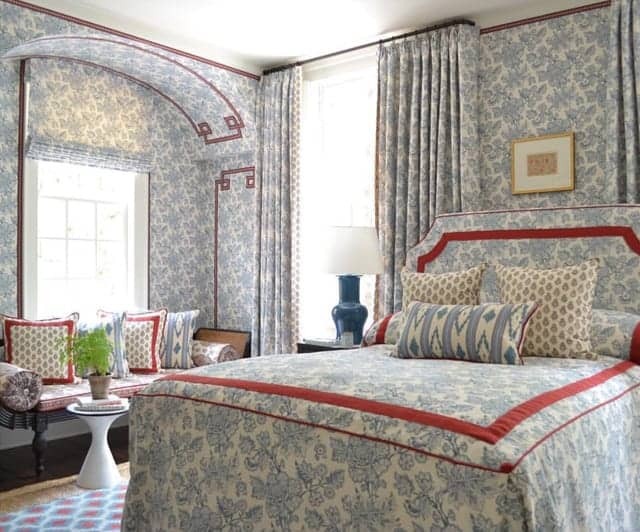 Creative use of trim to outline bedlinens, pillows, and walls gives the room definition even amidst the wash of a single pattern. 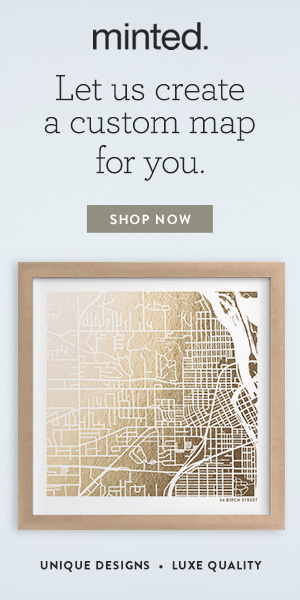 But I wouldn’t try to DIY the wall treatment. Brilliant red frames make the art installation, IMO. The way the vintage dhurrie that Sarah found coordinates with her fabric plan is just sick — in a good way — and a perfect lesson in mixing patterns: if you want a lot of pattern, you have to mix your scales and throw in some geometrics with your flowery frou-frou! Swathing a room in one all-over treatment creates a lovely cocoon. It’s über traditional, while still feeling a little whimsical. Too much for you, though? I have a 3 options for the look, including a couple for the faint of heart later in the post that balance and mix up this look a bit but still give you that seamless feeling, as well as my favorite sources for matching fabric and wallpaper. But first, for the fearless, the full-on treatment! The trick of using the same pattern on walls, window treatments, and/or upholstery in a room is centuries old. It works particularly well in a bedroom, where you might want that cocooned feeling, or a place like a dining room or powder room — places you aren’t spending the majority of your day and can be a little daring in the decor. Using the same pattern (or color) over and over again also allows your eye to move on, uninterrupted, and can create a sense of more space. Sometimes, you don’t want to call attention to every. single. piece. Both the French and the English love this look. The above two bedroom are in Versailles. Obviously, those were more decadent days…. Across the Channel to Bowood House, decorated by Fiona Shelburne. Fiona trained with Colefax and Fowler. 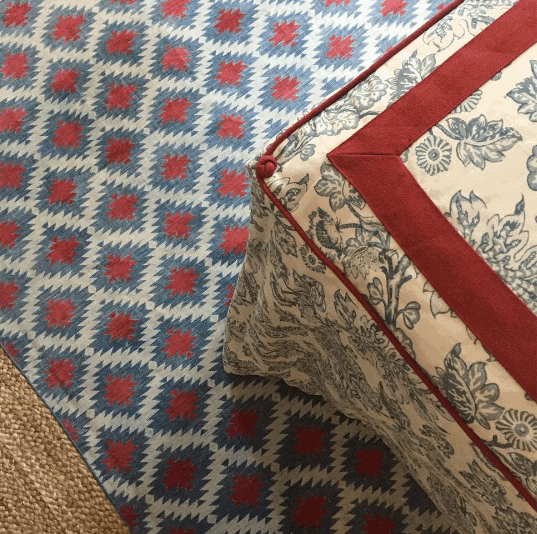 It’s funny how she then came to own (and decorate) Bowood House and used none other than Colefax and Fowler’s Bowood pattern for this guest room. American socialite Lee Radziwill, Jackie Kennedy Onasis’ younger sister, favored this look in numerous of her homes. Joni Webb at Cote de Texas, one of my absolute favorite blogs, did an amazing post on Lee’s homes through the decades as seen in the pages Architectural Digest. Below are more recent additions to the oeuvre by some very confident designers. Romualdez upholstered this master bedroom and its furnishings in Braquenié’s “Tree of Life” fabric. The look is broken up a bit by white wood shades on the windows, white bedding, and the green leather chairs. The pattern itself has a lot of white space in it, which keeps this room airy despite all the pattern going on. I love this room. Windsor Smith uses Peter Dunham’s Samarkand. I admit that some of the above, while fabulous, are a little much for even my pattern-loving soul. A least a little much for my soul to live in, day in and day out. I sure as heck wouldn’t mind visiting, though! This is the wrap look that I prefer. It feels a little lighter to me, even while enveloping. First, start with your walls and then choose to continue your pattern on windows OR upholstery. Mix in your solids or your small scale pattern that, from a distance, will read more like a solid. A heavy dose of white — either in your pattern or in your solids — never hurts! White bedding works wonders. Did you notice the pale yellow ceiling?! Leave to to Andrew Howard! I have loved this room for years. Again, a lot of white space in the chosen pattern. Dunham uses it for walls and windows, and some bedding, but then mixes it up with a green patterned chair and some big brown wood pieces. Sarah’s back with this sweet children’s bathroom. Here, the shower curtain continues her pattern. The happy green is as fresh as it gets! Again, tons of white. But I’m still nervous about wallpaper in a small full bathroom. She must be using an industrial strength fan. Did you even notice the headboard? Ha! Totally disappears. Talk about a great match job on where the upholstery falls on the wallpaper pattern. Window valences and wallpaper. Amy is not shy of going bold with her contrasting solids (or nearly solids) — I love the fuchsia. This is Clarence House’s Flowering Quince. Betsy Burgess’s little bench disappears…. and so does Windsor Smith’s little side chair in this dining room. Love the silk drapes. So classic. You could never accuse Miles Redd of being subtle, but even he throws in white bedding to break up this Bahamas bedroom. It can be hard for a lay person to track down wallpapers that also have matching fabrics. Two of the best sources beyond the handmade crowd are Schumacher and Thibaut. (Thibaut, in particular, is a wonderful source for reasonably priced, high quality matching fabrics and wallpapers.) Both are available through Home Glow. However, if you aren’t working with a designer, some of Schumacher’s matching patterns can also be found on Decorators Best for a markup, and Thibaut is often carried through nicer wallpaper and design stores. You can check the website for the nearest retailer. 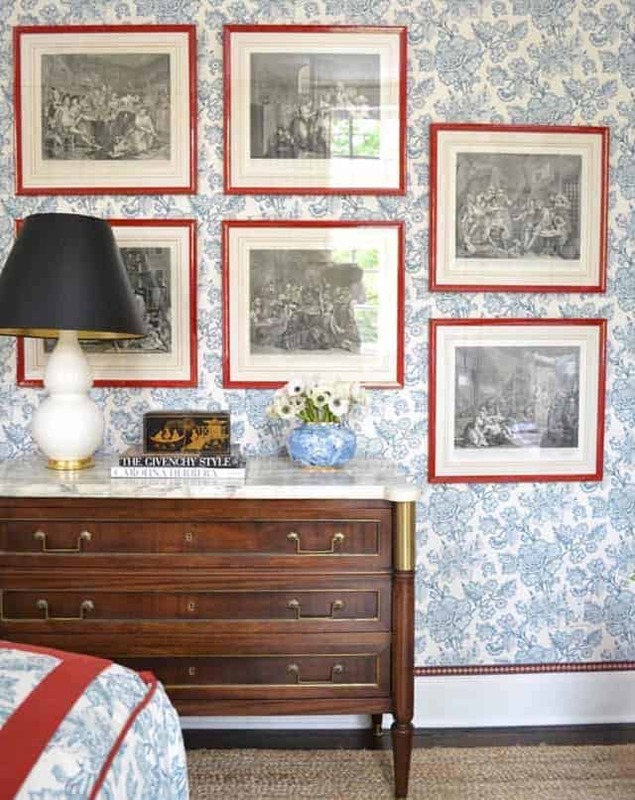 Below, I’ve collected 14 awesome patterns from Schumacher and Thibaut that come in both wallpaper and fabric options. These, of course, come in multiple colorways in addition to what you see below. Do you have a guest room, dining room, or powder room in need of wrap? Do you have a favorite pattern? Are you fearless enough to try a wrap? If you have any design questions that you would like me to address in this blog, please email me or get in touch through the contact page!